The cheapest way to launch an email marketing campaign is also the worst. So-called bulk email marketing involves buying a large list of email addresses and sending your email offer to all of them. The recipients didn’t ask for your offer and all but a tiny fraction of them don’t want it cluttering up their inboxes. Your offer is spam and you are a despicable spammer to them. You're really buying millions of enemies when you buy a bulk email marketing list. Slightly more expensive and effective are "opt in" email marketing lists. The people on such lists have, at some time and in some way, "opted in" or given consent to receiving email marketing offers. But there are many devious ways in which email list compilers trick people into opting in unwittingly. Before buying an opt in email marketing list, go through the opt process yourself to see how it is done. If you don’t feel it’s perfectly clear what you are opting into, don’t buy a list from that email marketing service. The people who opt into email marketing lists may do so for reasons that do not include buying anything from you. To build a list quickly, list brokers may offer freebies to people who opt in; some people opt in just to get free software, a ringtone, or an ebook, and have no intention of buying anything. So when they get email from your company, they probably won't remember opting in, and will quickly hit the "Mark as Spam" button. This has a side effect that most email marketers don't realize. When lots of people at lots of Internet Service Providers mark your message as spam, your website will be flagged as a spam source, and may even find its way into various blacklists that ISPs use to filter incoming emails. So any future emails -- even if they are sent to your loyal customers who DO want them -- may end up in a spam bucket. Your own prospects and existing customers are the best email marketing audience you can have. Every contact that you have with prospects or customers should request their permission to send them email offers, if you don’t already have it. Call your email offer an "exclusive, insider benefit" if you wish; it helps to make people feel special when requesting their email addresses. Sincere shoppers usually stop being interested in things once they have bought what they need. If I purchase a refrigerator, I don’t want any more of your refrigerator email offers; your helpful email marketing messages about refrigerators you have on sale are now spam to me. If I’ve been laid off and have no money to spare for earrings, it irritates me to receive temptations from you. So every email offer you send should include an easy, one-click way to "unsubscribe" or "opt out" of your mailings. You can get software for doing email marketing in-house. There are dozens, if not hundreds of commercial packages available. But there are also free, open source email marketing software programs that range from the very simple to the highly sophisticated. OpenEMM is one of the sophisticated examples. Developed by the open source community since 1999, it is a feature-rich program that can handle the email marketing needs of the largest enterprise. PHPList is a simple program that interfaces with prospects and customers via a Web site. It’s written in the PHP script language so it should work with virtually any Web host. It includes all the features you need to manager an email marketing list ethically and profitably. It even includes email templates to help you design effective email marketing messages. The downside to managing your email marketing in-house is that email deliverability is a tricky thing. Whether your message makes it to the intended inbox, or gets shunted off to a spam folder, depends largely on the reputation of the sender. And as I mentioned earlier, even people who HAVE opted in to your list may forget and hit the Spam button. If this happens often enough to trigger some arbitrary threshhold, you could be doing long-term damage to your business. Managing an email marketing list so that it makes profits instead of enemies is a significant job. That's why some companies hire full-time specialists in email marketing strategy and email list administration. 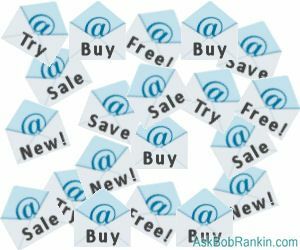 Smaller firms may outsource email marketing chores to email marketing services such as Constant Contact or AWeber, which I use to manage and send out the "Ask Bob Updates" newsletter. Aside from alleviating the grunt work of managing the subscriber list, email marketing services help you to easily create website signup forms, provide professional looking templates, and offer reporting on open rates and clickthrus. Advanced users can do segmented mailings, geo-targeting and split-testing to fine tune the list of recipients and the messaging. My best advice, if you're serious about building an email list that can be used as a business building tool, is to hire a third-party service to manage your email marketing. Also, keep a clean list that only has confirmed opt-in subscribers. This means only those people who request to be on your list, and then confirm that request from a followup email. And of course, honor all opt-out requests in timely fashion. Most recent comments on "Business Email Marketing"
Nowadays Email Marketing is easy with the web based service providers. Your newsletter gets through my ISP's spam filter but comes to my in box with a warning that it may be spam and I have to answer the question do you want to visit this site yes in order to go to your web site to read the articles. EDITOR'S NOTE: Sounds like an overzealous spam filter on your end. What email and security tools do you use? No doubt you'll quickly approve this message... This advice about spam, from a guy on a website that forces unwanted, annoying pop-ups on us when we're trying to read (2 within 10 seconds). So you manage to go insultingly against our express wishes and override our stated preferences. Kinda like a Bible thumper... pick which things to be against, ignore the bad things you do yourself. EDITOR'S NOTE: There's an old saying: "Freedom of the press belongs to him who OWNS one." And with the advent of the Internet, almost anyone can. So why not start your own website, spend 6-8 hours a day researching, writing and publishing high quality information, and do it for FREE? Go for it! Nothing is being forced on you at this website. You're free to visit or not, read the articles or not, and it costs you nothing, except the "annoyance" of having to swat a popup that helps me earn a living. And to equate that with "spam" -- your logic escapes me. Thankfully, I get plenty of notes from grateful readers who take the time to say thanks for the help they've received here. I don't publish those, but they do help to balance things out, and inspire me to keep writing. I have been riding the Tourbus for many years, and usually learn something new and useful in each issue, and I recommend it to my students. Don't forget your PC users with only moderate experience, seniors in my case! Thank you for a fine newsletter.